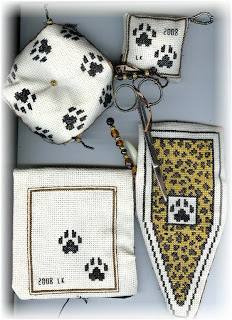 Lori has sent photos of her completed Cheetah Needlework Set! Isn't it wonderful?! I am so excited to see these charts getting stitched up and finished! Mine never seem to make it past the cross stitching part. Lori is another of those "overtime" stitchers I previously mentioned. You may remember the photos that I posted earlier of the Hummingbird and Dragonfly charts she finished, if not you will find them here. Thanks for sharing the pics, Lori! I am so glad to hear you enjoyed stitching the set and using it. Now you really need those Cheetah scissors! She did a beautiful job - great patterns, too! Oh it's lovely Harmien! 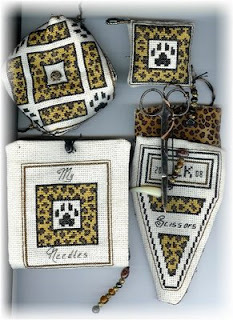 How nice for you to see the lovely things stitchers have made from your patterns. I haven't made the cheetah fob yet but I have the scissors waiting for it! For some reason the Cheetah scissors are found very reasonable on eBay while most of the others are way too expensive. Maybe they made extra of those. You have lovely things on your blog - thank you and happy holidays!